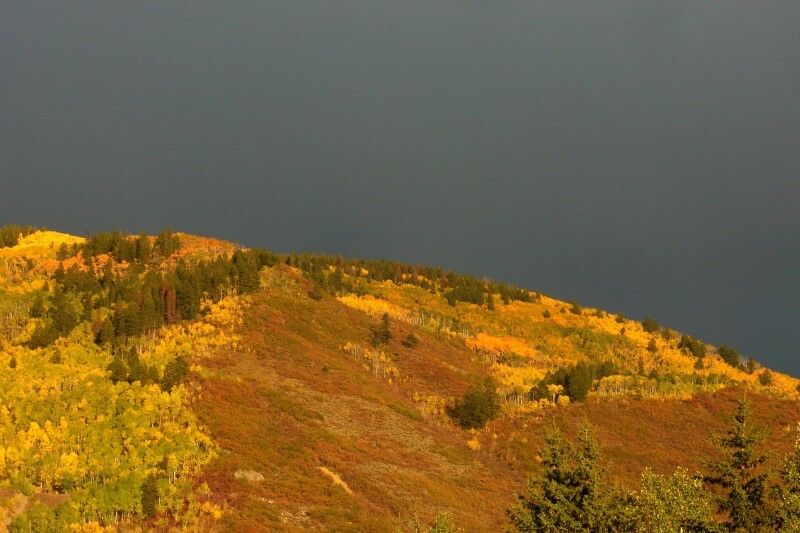 Sun on the fall hillside, with an evening storm looming provide great colors! Since Fall is giving way to Winter… I thought I’d post some more of my Fall photos. The mountains and weather patterns here in Aspen really provide some exceptional lighting in the mornings & evenings. This was the view of Smuggler Mountain, as I was walking into my condo a few months ago. So striking, with the sunshine highlighting the aspens, as they are starting to burst into full color, and the dark sky providing the contrasting backdrop. This entry was posted on Tuesday, October 28th, 2008 at 11:55 pm	and is filed under fall and tagged with aspen trees, fall, Smuggler Mtn. You can follow any responses to this entry through the RSS 2.0 feed. You can leave a response, or trackback from your own site.